If your chickens are eating their own eggs, you need to break this habit immediately. The longer they do it, the harder it becomes to fix. 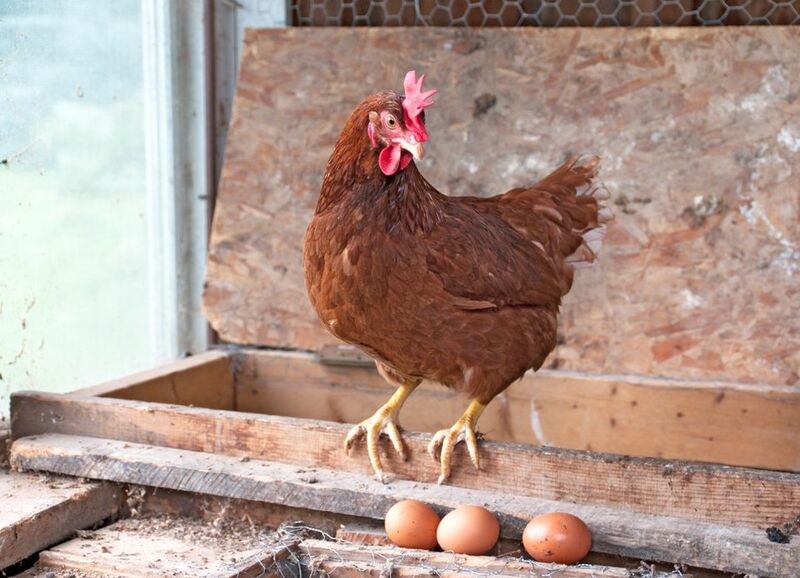 Nip this bad habit in the bud with a few tweaks to the hens' nest boxes and living situation. Preventing egg eating in the first place is easier than stopping it after the habit is formed. Egg breakage is one of the main reasons hens begin eating eggs. Reducing or eliminating egg breakage minimizes the chances your hens will get a taste for raw egg. Provide at least one 12-inch-square nest for every 4 or 5 hens in the flock and never fewer than six nesting boxes. Nesting boxes should be positioned at least 2 feet off the ground and at least 4 feet from the roosts. Keep at least 2 inches of clean, dry nesting material (shavings or straw) in the nest boxes at all times. Relocate any broody hens, which cause congestion in the nesting boxes. Keep eggshells strong by feeding a calcium supplement—usually sold as oyster shells—in a free-choice feeder. Feed your chickens a complete feed specifically designed for laying hens. If you feed hens eggshells for calcium, smash them to a powder so the chickens don't associate them with the eggs. Collect eggs early. Collecting eggs early in the day leaves less time for breakage and egg eating. Most hens are finished laying eggs by 10 a.m. Practicing egg breakage prevention may be all it takes to stop your hens from eating eggs, even if they've already started. However, other things you can do to put a stop to egg eating is to take steps to lower stress. Avoid bright lighting near the nesting boxes. Don't disturb hens in the nests. Make sure you have enough space for each hen in the coop. Keep fresh feed and water available at all times. Set up a second feeding station if one hen is bullying the others by guarding a single feeding station. If possible, provide hens with space outdoors to roam or at least a run with fresh grass and bugs. If you have one hen who's determined to eat eggs despite all these tips, consider culling her from the flock. She'll just pass on the bad behavior to the other hens, and then you'll have a real problem on your hands. Buy roll-away nesting boxes. When the hen lays an egg, the egg rolls out of the nesting box, and the hen can't reach it. Place golf balls in the nests. In theory, the hens will tire of pecking these "eggs." Fill an eggshell with mustard, which chickens hate. Make a small hole at the ends of an egg and blow out the contents. Replace the content with yellow mustard. Place the mustard-filled egg in the nesting box. Clip the offending hen's beak. This sounds worse than it is. Trim only the tip of the beak. Just like your fingernail or a cat's claw, the beak contains live tissue; cutting too far causes bleeding and pain. What Do I Do With This Broody Hen?